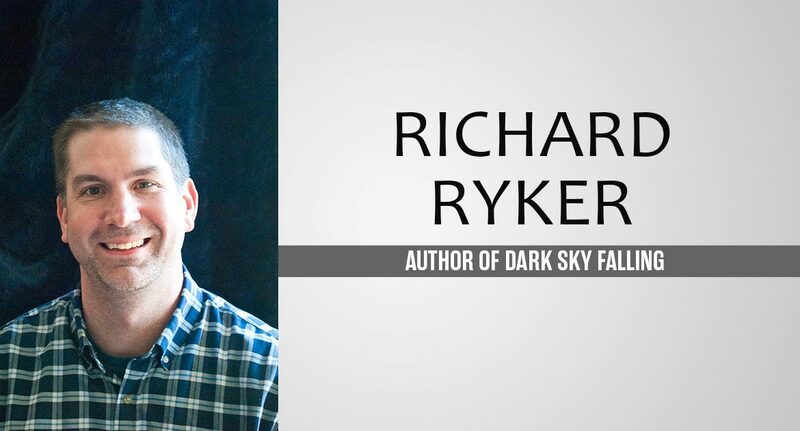 Richard Ryker is the author of Dark Sky Falling. He is currently working on his next novel, set for release in 2018. Richard’s first career was as a mental health counselor, where he spent many years as a crisis interventionist. When not writing, he enjoys playing piano and guitar, reading, hiking and binge watching shows on Netflix. Lunch breaks are key to my writing process. I wrote almost an entire novel on my laptop in the front seat of my Honda Civic (that’s saying something, since I’m well over 6 feet tall!). During the cooler months, I spend lunch at the local café. Saturday mornings are crucial too. I wake up early and write until the afternoon. Like most writers, I’m thinking about my characters all the time, so I’ll jot down notes on the way home from work (I’ve learned to write without looking down). In my other life, I worked as a crisis interventionist helping (I hope) thousands of individuals. Sometimes I miss hanging out in the emergency department at two in the morning, or going out on calls with the police. Then I remember how much I love sleep — not something you enjoy often as a crisis worker. Is Dark Sky Falling the first book you’ve written? What made you choose to do self-publishing over traditional? 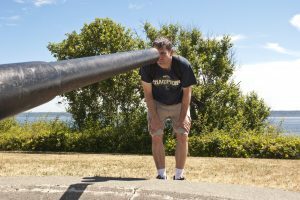 Is there any advice you can give to other self-published authors? Dark Sky Falling is the third book I’ve written, but the first I’ve published. My other completed books are in the middle-grade fantasy and historical fiction genres. I had an agent for Dark Sky Falling for about nine months. She was great to work with, but in the end we decided to part ways. Then, I started listening to podcasts on indie publishing I decided to give it a try. One of the greatest benefits of indie publishing is the ability to control your own work and advertising. My advice would be to take advantage of the lessons learned by those who’ve been doing this a while. I listen to the Sell More Books and Marketing for Science Fiction and Fantasy podcasts (they cover much more than sci-fi and fantasy). There are lots of great books out there on the topic too. Currently, I’m working on final edits of a Y/A novel while plotting a mystery-suspense story that will be the first in a series. Without a doubt, the Lord of the Rings box set. Yes, I know a box set may be cheating, but Tolkien did write these as a single novel (so I’ve heard). I’ve re-read Lord of the Rings at least a dozen times since I first encountered the opening sentence of The Hobbit the summer before seventh grade. “In a hole, in the ground lived a hobbit…” Classic! Second would be the complete short stories of Chekov (am I cheating again?). There’s something about Russian literature, and Chekov’s stories in particular — a stark realism that nonetheless leaves room for hope in the lives of everyday people. My final book (I am sticking to fiction here) would be Tolstoy’s Anna Karenina, a masterpiece of literature in any language. The two storylines (Levin/Kitty and Anna/Vronsky) are a masterclass in imagery and plot weaving. Where did the idea for Dark Sky Falling come from and how were you inspired to write it? Losing a child is a parent’s worst nightmare, especially when the one who takes her is someone you trust. 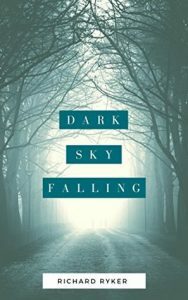 Dark Sky Falling is about a widower (Marcus) who is raising his eleven-year-old daughter Alyssa with the help of a nanny — his former sister-in-law Kamila. I set the book in Russia partially because of my love of Russian literature. It took hours of research to get the setting and local characters as accurate as possible. Although the process was time consuming, I enjoyed learning about the history and current social/political environment of Russia and Chechnya. What actor/actress would you cast to play Marcus in Dark Sky Falling? Matt Damon. He’s the kind of actor that is great at playing the tough guy who happens to be smart too. What do you think readers will love about Dark Sky Falling? Complex characters dealing with real-life problems, an exciting plot that includes the surprises, and turns that you expect from a suspense/thriller. Questions that you want answered, but a story that makes you wait until the end to find out what really happens. Tonight Marcus stepped back into the world of dating for the first time since his wife died. What he doesn’t know is that his nanny has just abducted his eleven-year-old daughter, Alyssa. To Russia. Marcus embarks on a journey to find his daughter, battling corrupt embassy staff, Chechen rebels, and the Russian Army. Will Marcus be able to save Alyssa in time? I’m working on a second book in which a young college student with dreams of making it to Julliard finds out her long-lost father has money that could help her get there. After her mother dies, she decides to find her father, gain his trust and get him to help her go to Julliard. The seed of this idea came from a conversation I had with an older man who, earlier in his life, had given up a child for adoption—a choice he and his then girlfriend made together. The man expressed regret about the decision. From there, my main character was born.